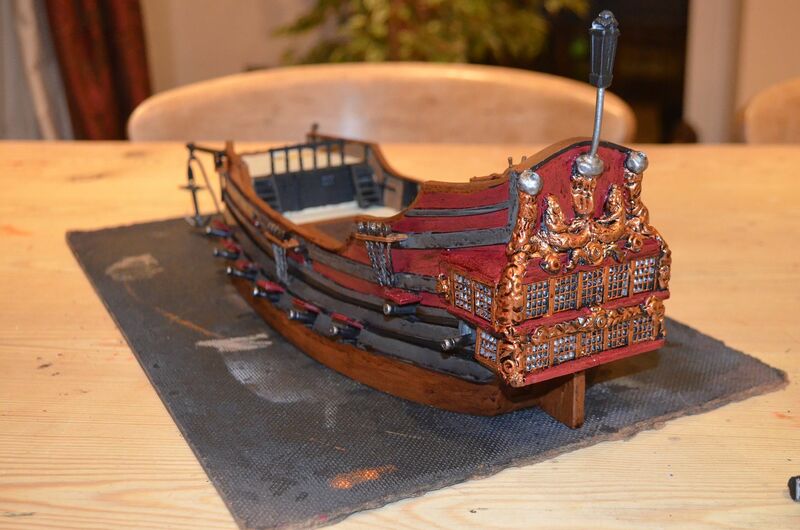 However I did manage to source another little Pirate ship which with a bit of conversion might be ideal for a small sloop. 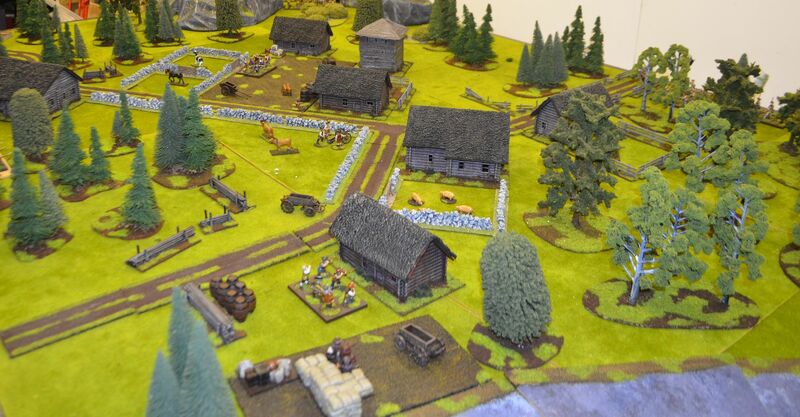 Last night saw the first table top action in the Shed for 2013 and boy did we have a great game. The table was set for a fictitious engagement in the French Indian wars. 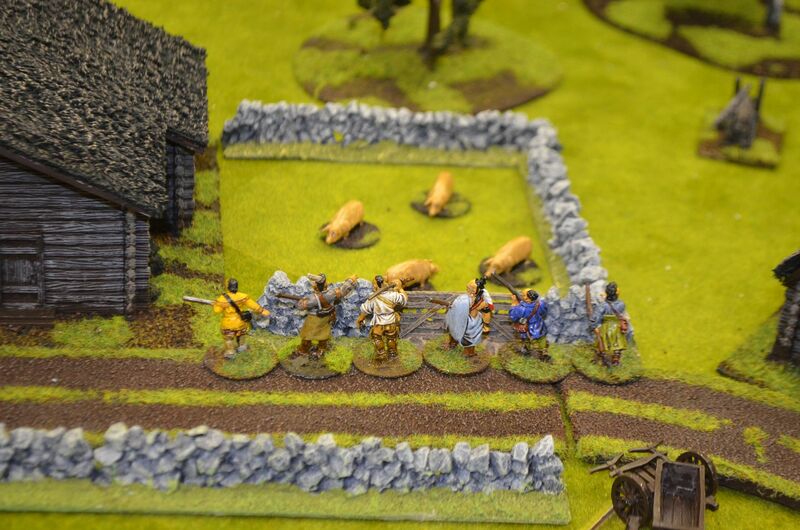 We used the excellent Muskets & Tomahawks rules. 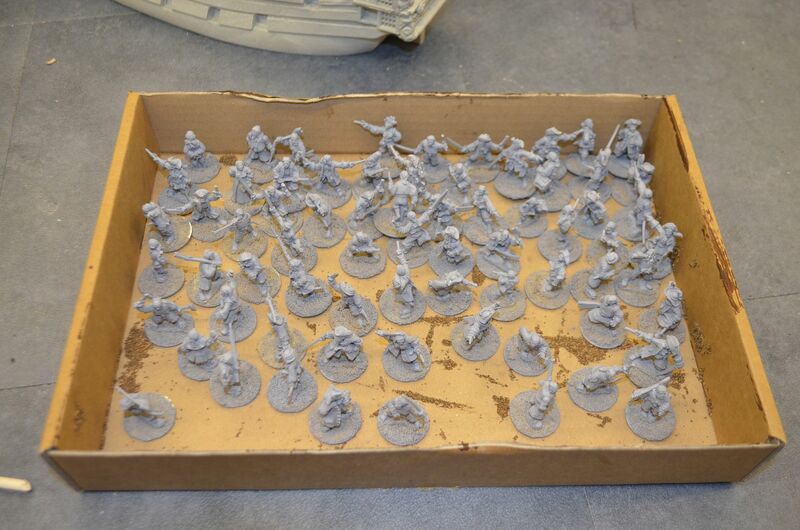 Figures are a mix of Redoubt, Perry, and Galloping Major. 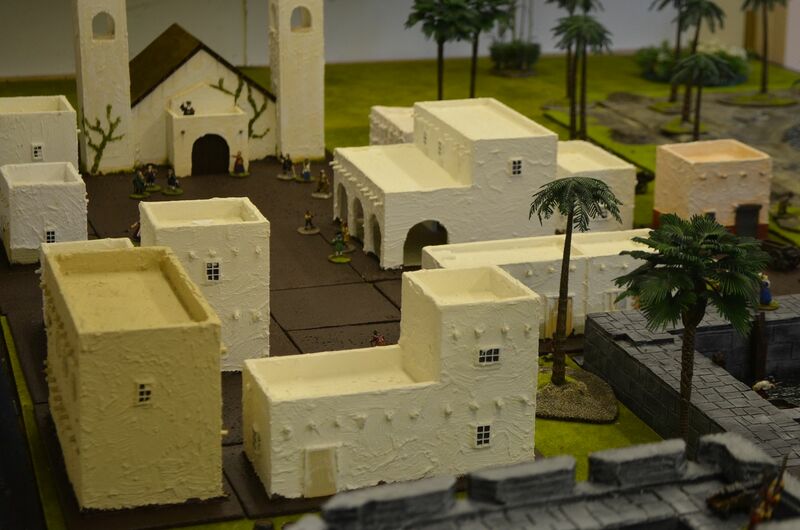 The buildings are from Pegasus Hobbies and the rest of the terrain is scratchbuilt. It was the first time all of the trees came into play. The table itself is 5ft x 10ft. The French forces commanded by Captain Dhillon consisted of. All units were standard classes and were all musket armed. 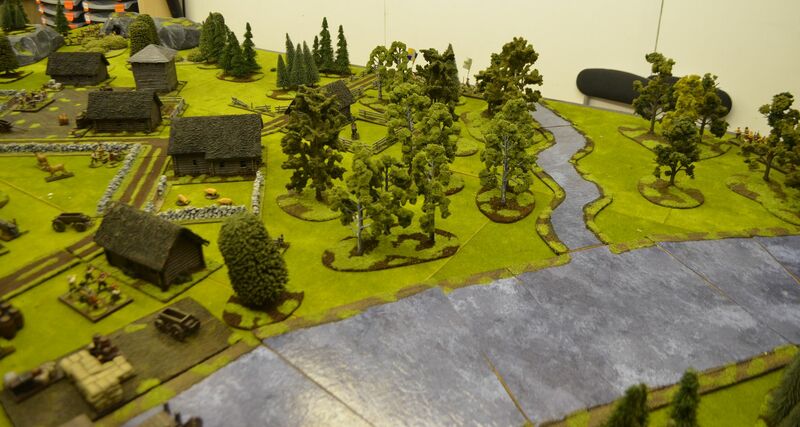 The French objectives were simple advance and capture the small jetty/port at the village of Parsons Creek. The British objectives – stop the French from seizing the small port. 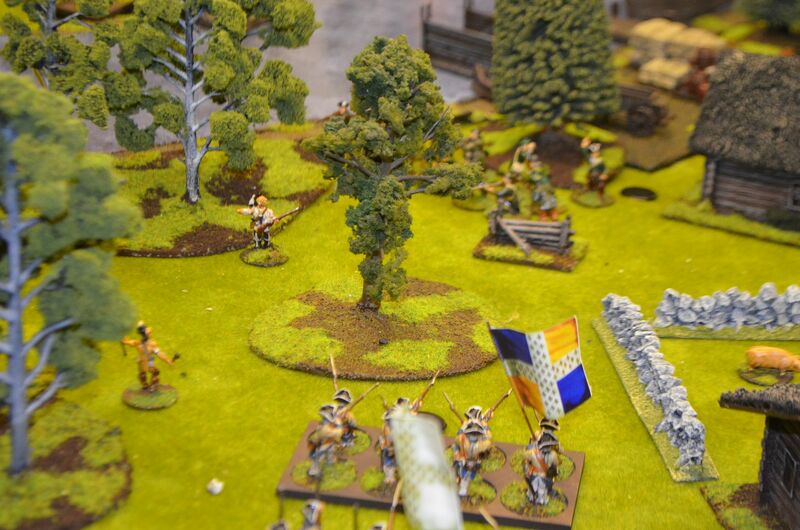 You will note that there are no points values assigned to the units – I didn’t have time to work this out but I suspect the British Forces albeit outnumbered had a higher points score. We also dropped the secondary objectives for the officers, this was a mistake but I completely forgot to roll for these at the beginning of the game. 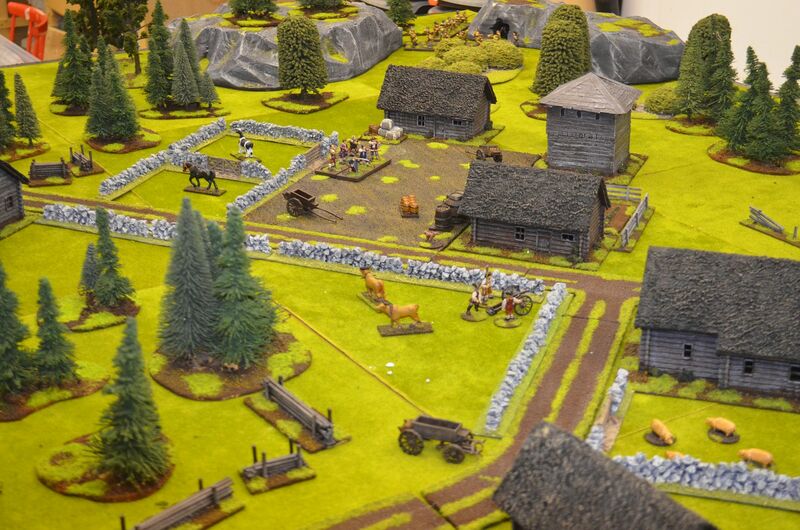 The British provincials & artillery started on table around the village and jetty. The Rangers would arrive on the ‘wrong side’ of the port, the British Indians would travel up from the Southern Road and the British Regulars would arrive from the western road. 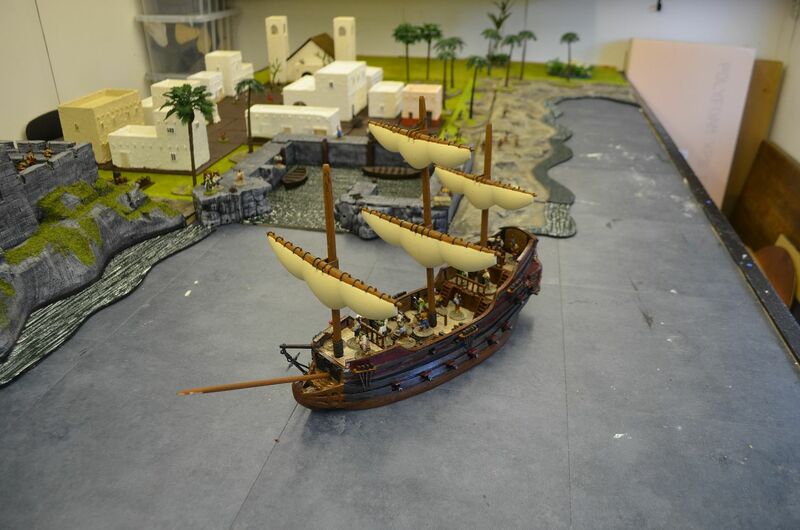 The starting positions were diced for so loud groans were heard when it was discovered that the bulk of the British force would need to traverse the length of the table to get to the port. The French force deployment were much more straightforward. The large contingent of Indians would make their entry from the northern side of the river near the waterfall. 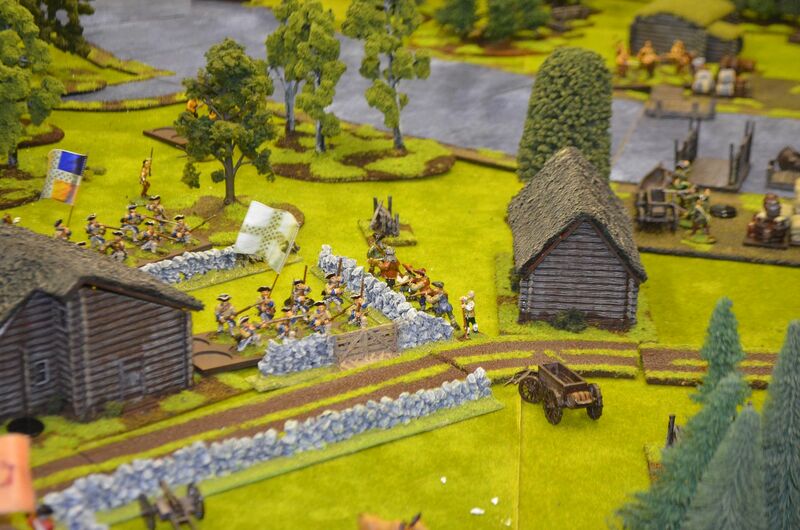 The French regular forces would arrive on the Northern road with their western flank guarded by the French woodsmen. The cards were shuffled and turn one commenced. 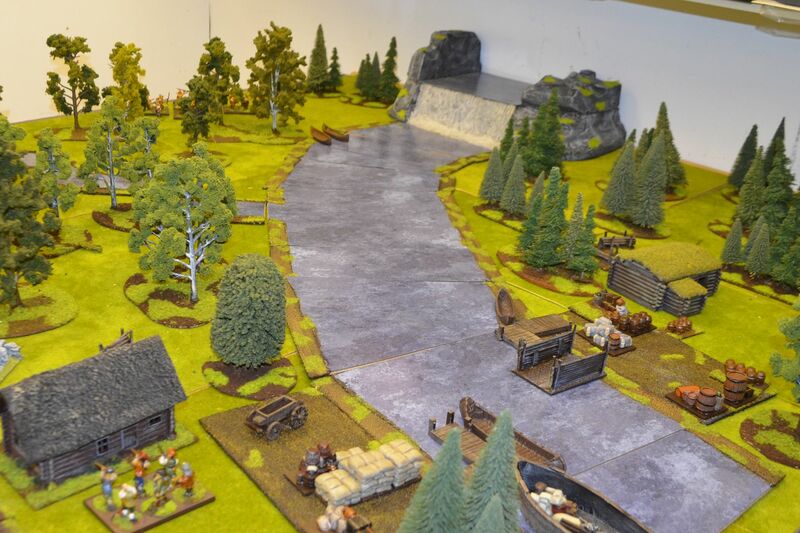 The French Indians advanced to the river with the force splitting, two units were going to cross whilst the others advanced up the western bank, the French woodsmen advanced, skirting the village, aiming to head off the ranks of British regulars marching along the western road. Meanwhile the French regulars hemmed in by the tree cover either side of the Northern road took the direct route and headed in towards the village. Meanwhile the British rangers reached to the eastern side of the port and planned to cross the river as quick as possible. 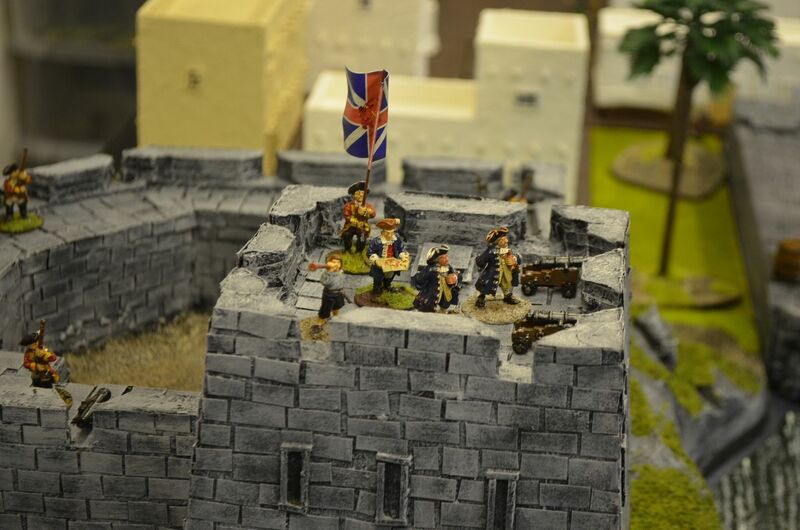 The local provincial troops took cover in the blockhouse and the buildings around the jetty, and the units of redcoats marched in along the western road. Half the French Indians crossed the river using the canoes carefully positioned on the Northern bank, the others advanced through the dense woods towards the port. The Provincial artillery opened fire on the marching French column. 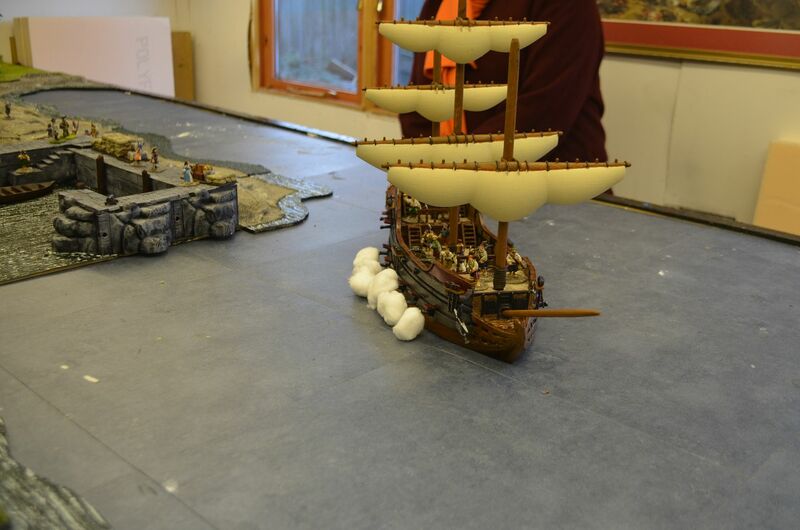 This was the first time a cannon had been fired in anger in our games and the results were devastating. A round shot careered through the ranks killing 4 men and sending the remaining troops into flight. First strike to the British. Meanwhile a unit of French Coureurs had spotted the British line, a volley of shots were fired drawing disdain from the waiting ranks. With a disciplined manoeuvre the British line turned and let rip with a hail of lead. One Frenchie hit the dust forcing the others to recoil in panic. Mean while the rangers started to cross the river. The French forces continued to press home their advance. By now the two other units of Coureurs had encamped in the stone walled field and went onto vigilance waiting for the British redcoats. 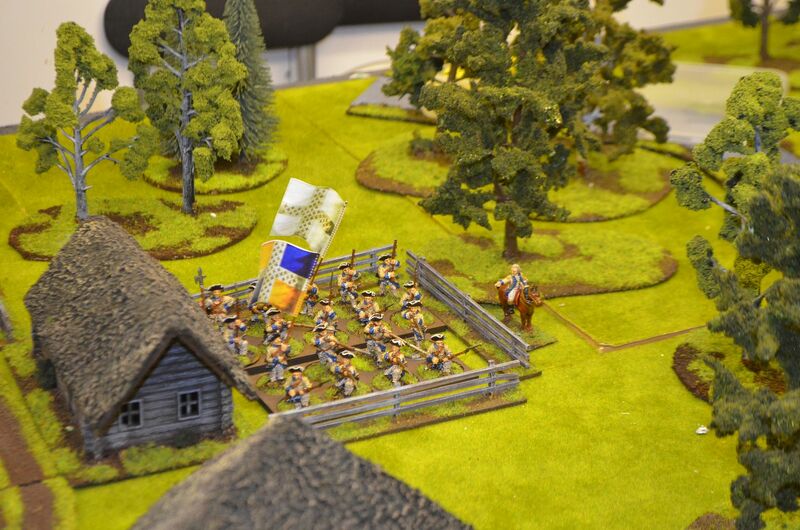 Sporadic fire from the blockhouse provincials kept their heads down but no casualties were drawn. The French Infantry realising that route one was not so sensible left the road and marched through the small gardens behind the village towards the jetty. The Indians started to pour sporadic fire into the rangers disembarking from the boats. The timing was not quite right and not all the Indians could be brought into melee. The Rangers counter charged and when you have fourteen against six there will always be one result. A unit of Indians were wiped from the field and the Rangers returned to their defensive positions around the port. We had one event card drawn this turn – Wild Animals. Unfortunately one French Indian was savaged by a nameless beast. 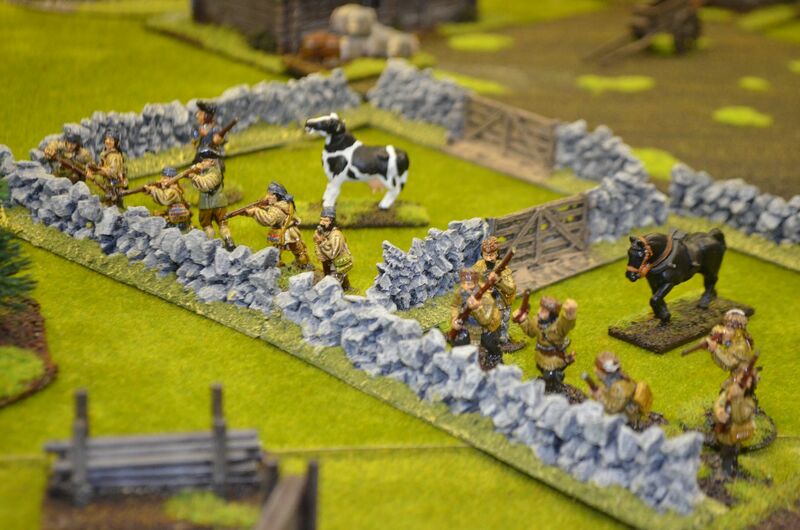 The French Infantry continued to march forward but their progress was hampered by the difficult terrain. The units that had suffered so badly from the cannon crept forward and took cover in one of the buildings. Another first, the cannon fired into the building – the die roll suggested that it had been damaged (+1 on next roll) but the defenders were safe enough. Meanwhile the Indians who had crossed the river were now engaged in a long range duel with the Rangers on the other bank. 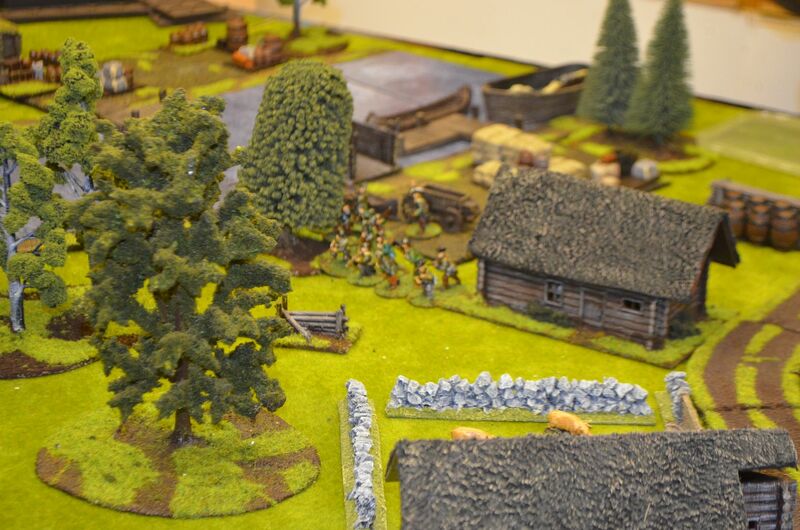 In time the superiority of the Rangers rifles would tell but sporadic fire caused casualties on both sides. Things were becoming desperate for the British with half the forces still out of action and stuck along the western road could the French push home their advantage and seize the port. 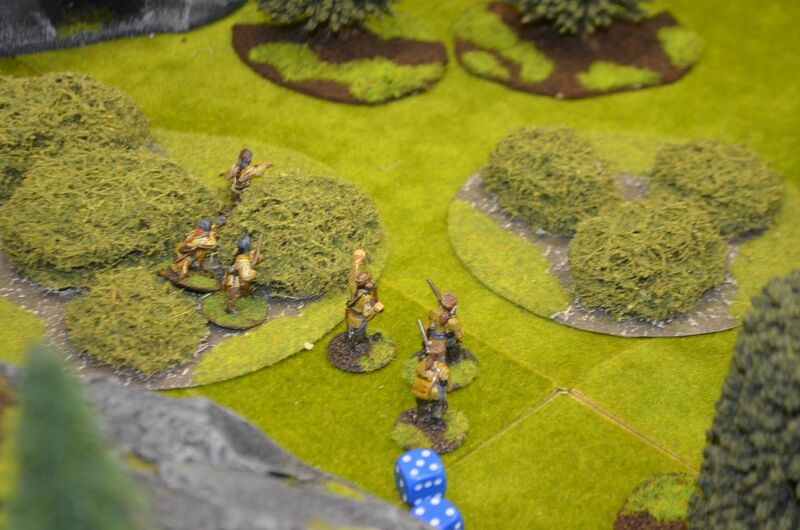 The French line moved forwards letting rip with a volley into the defending rangers, more men went down. The British commander at this point sent forward his provincials to fire a volley into the flank of the French Infantry at point blank range. Would the cards be kind and show up a chance to fire before this manoeuvre could be counter acted? Until now the British Indians had been in-effective and this continued, a blast of fire from the most advanced French line reduced the unit to two men causing the remainder to flee. 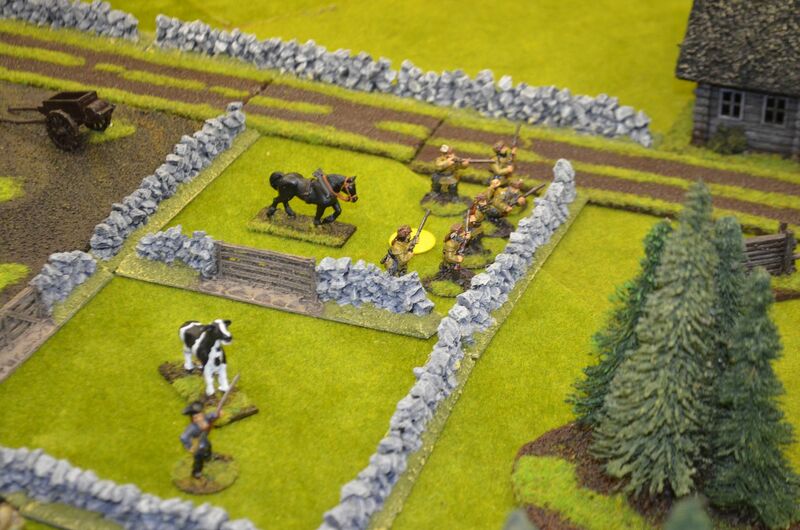 The British line pushed forward and two firing lines targeted the concealed Coureurs, they opened fire, with lead crashing against the stonewalls and a couple of men down, this Coureurs unit broke and fled. The second, recognising that their six muskets against twenty was always going to end in tears retreated into the village. We started with a random event: Friendly Fire unfortunately the French Indians again were the target an another man succumbed to the vagaries of randomness. With the cannon reloaded another round slammed into the building holding the remnants of the first French platoon, the building was still standing just but for how long? 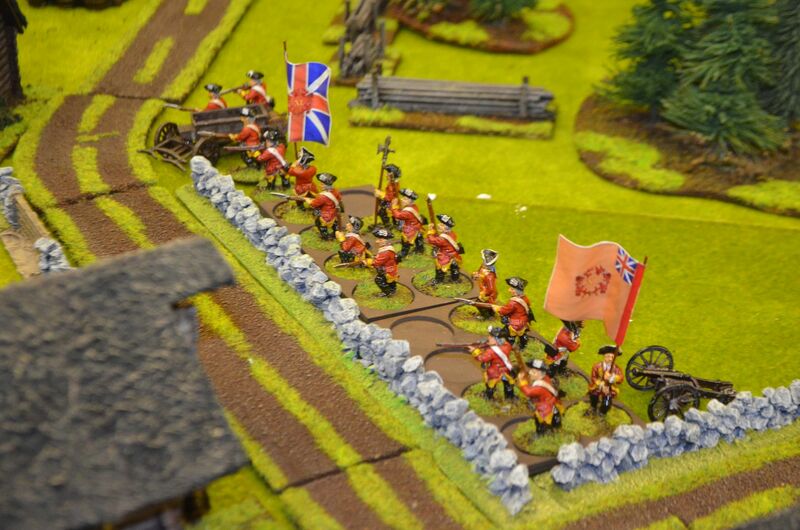 With the road free the British regulars marched forward hoping to relieve the beleaguered rangers. 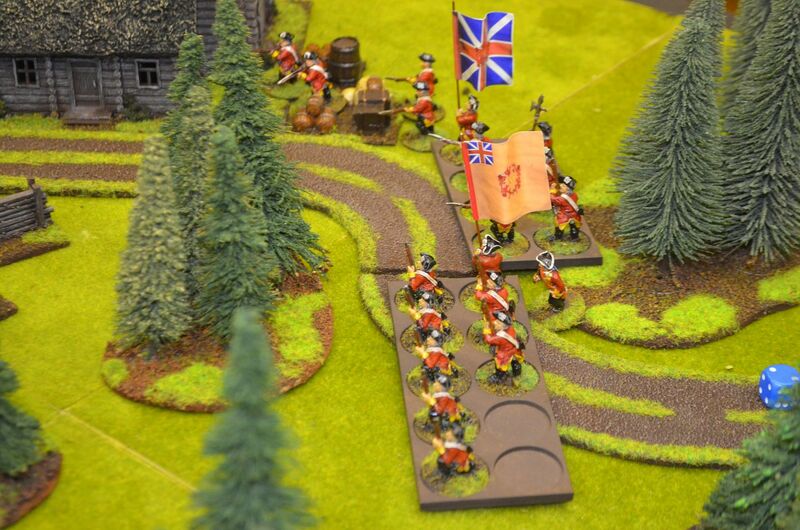 Recalling the provincials move to the flank of the French regulars a cry of despair could be heard as the regulars action arrived first. Wheeling to face these flanking troops a volley at close range ended the threat sending the Provincials into a headlong flight. 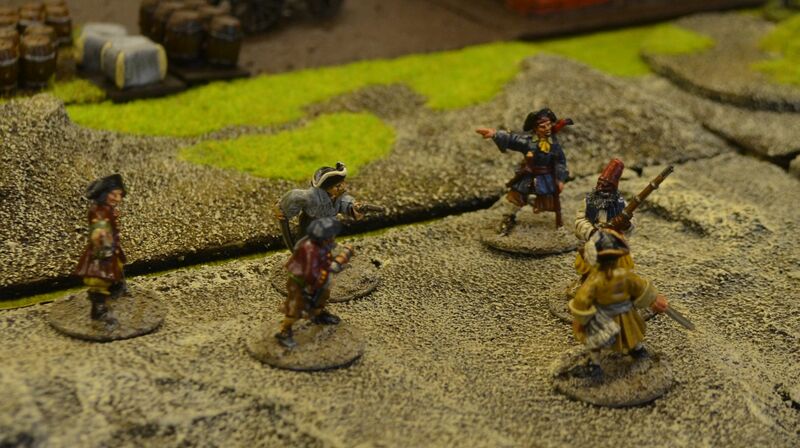 The last remaining Coureurs unit seeing an opportunity to silence the cannon crew charged only to be defeated. Two cards later they charged again silencing the gun for the remainder of the battle. But was it too late? The Rangers continued to offer stiff resistance, driving one unit of Indians off from the far bank the second unit targeted the French lines moving forward. The fight was becoming fast and furious with the French now hitting the 50% casualty mark. Finally the British regulars platoon fire could be brought to bear on the French infantry, with a deafening sound the French line crumbled in the face of such ferocity. The remaining rangers both now down to a few men each continued to provide stout resistance. The attack had failed and the British forces could count their blessings that they had emerged victorious from this bloody fight. Once again the rules delivered a fast furious and very exciting game. Right through to turn five the French could have still won, but with the cards favouring the guys ion red and some fantastic die rolling on both sides it was a another game that was too close to call. 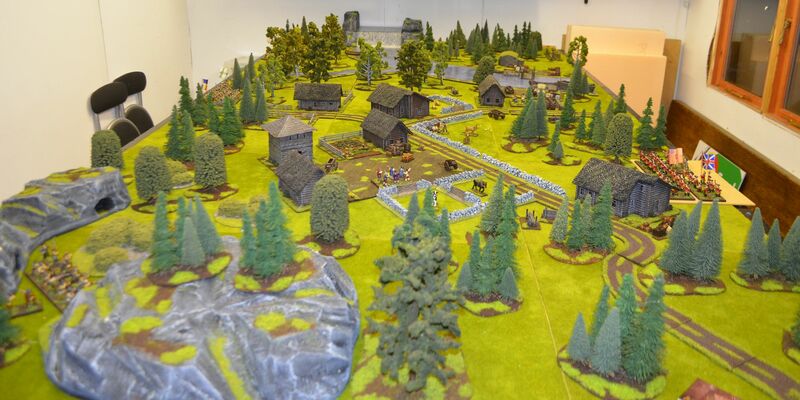 The introduction of artillery added another dimension and the shooting at buildings is great fun. Perhaps we had too much dense cover as the forced both regular forces to take the most direct routes on the roads, but it did reinforce the advantages of the light troops. Once again the rifles came into their own for long range shooting but once it gets close and dirty they do become a liability. As a group we are considering the size of the Indian units, they do tend to be very fragile, so next time we’ll bump the unit size up to eight to see if they work better. 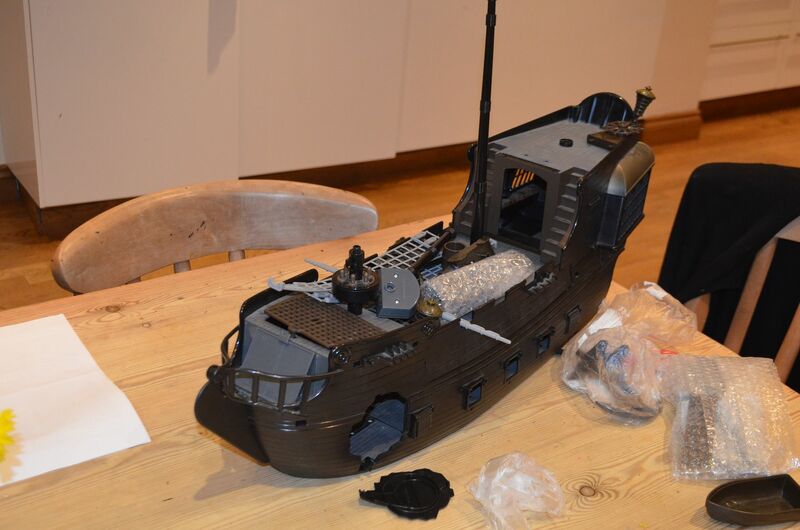 Its been a few days since my last post - work and domestic arrangements seem to have got in the way of the various builds and I have yet to roll the dice in anger this year. 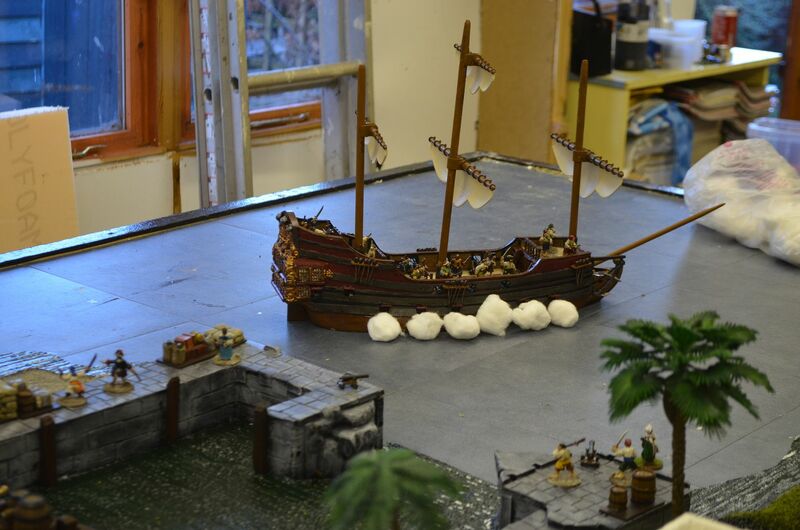 Hopefully by the time I post this I will have played another M&T game in the shed – this will get posted shortly. 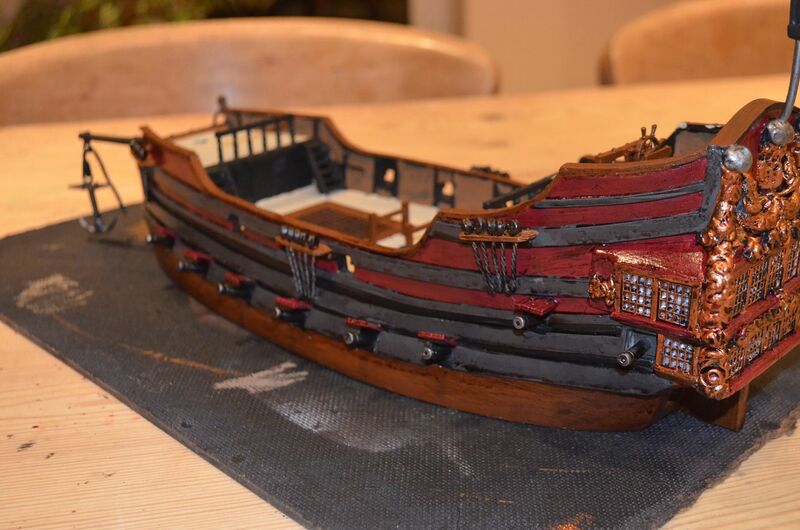 I have however nearly finished painting the pirate ship Cerberus – still need to mount the masts, sails and rigging but it is starting to take shape. 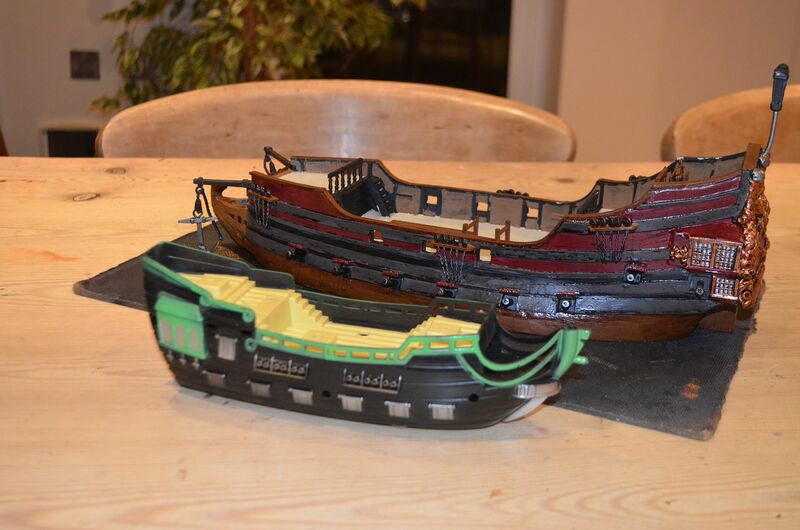 I also finally finished painting the Pirate horde from Foundry. I have ordered a few more figures to complement the crews and these should arrive in the post soon. 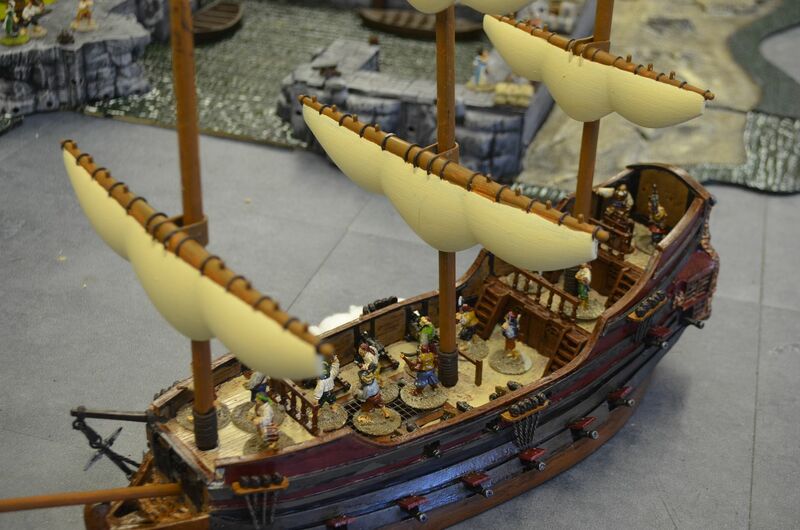 By the time I am finished around 100 pirates will be mustered to fight the battles. 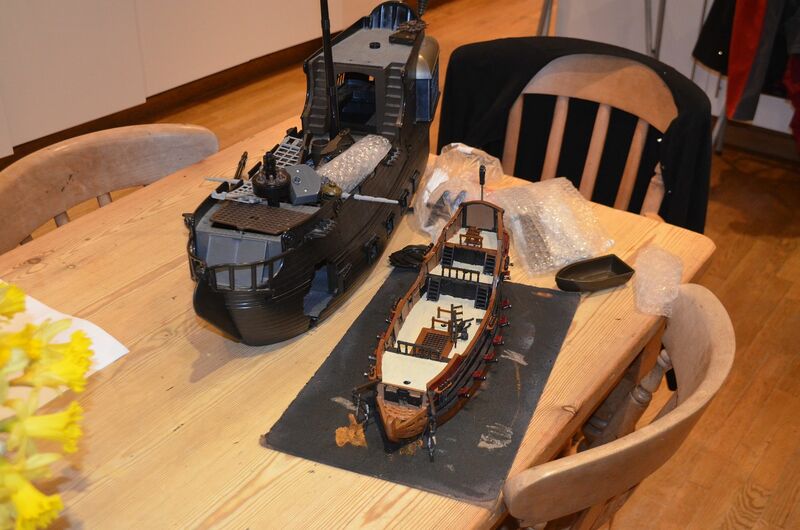 The last big task is to source some more ships – I will be ordering the merchantman from Ainsty Castings, and I am waiting on a Pirates of the Caribbean toy ship recently sourced from Ebay – based on some pictures seen elsewhere on the web I should be able to make the necessary conversion.